Thanks to Caliclimber, whose Flickr pages remain a true delight, but who notably in this case did not merely archive but actually designed the album art. Which is not really the album art. But you probably read that already. Jack & Faye, Nall, retrieved September 17, 2017.
acowkickedme: I do believe I remember John saying (in some bootleg) that he had left the original copy of the EP in a taxi cab in New York. acowkickedme: Anyone know if this is true? Yeah this is true. January '96, in NY to play at the Knitting Factory (1st KF gig for me ever) and deliver the DAT to the guy who was gonna release it. It must have fallen out of my backpack or something. Fortunately Bob Durkee had made & kept a backup. There is a frequently-promulgated fan theory that the name Jack & Faye is related to the film Chinatown, which starred Jack Nicholson and Faye Dunaway, but I have found no evidence to support this. I assume the guy who was going to release the 7" still has it but it's unlikely that I'll ever have it, so it's lost. The artist mentioned is Seth, the famed comics author and illustrator. The cover art frequently associated with the album — and used here — is by Caliclimber, may he live forever. As excellent as it is, it was never officially part of the album release. 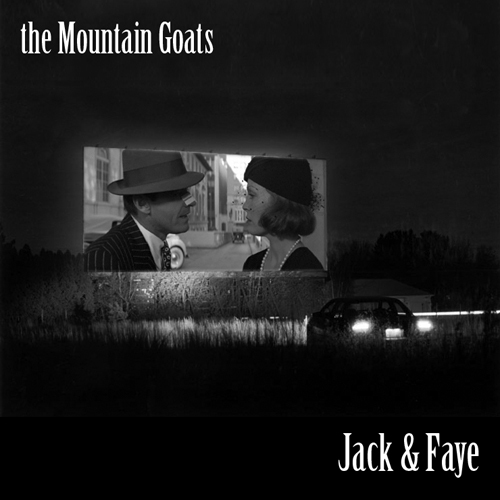 Jack and Faye was to have been a 7" containing the final recordings by the Mountain Goats of the Sweden/Nine Black Poppies/Nothing for Juice era. There were multiple delays. At one point there was finished artwork. Then there were more delays. Eventually history staked its claim on these recordings and it was almost as though they never even existed at all. Well: here they are, finally, in the mp3 format. Just grab them and they are yours, free of charge. If enough people show interest in obtaining some sort of cover art and liner notes for the Jack and Faye single, this site will eventually provide a "cover" which you'll be able download and print out, either for cassette or CD-R. Express your interest in this possibility by writing to nall@themountaingoats.net. The songs themselves were recorded in December of 1995 and January of 1996 in Chicago, Illinois and San Dimas, California. John and Rachel considered them some of their best work and were especially fond of "Raid on Entebbe." Time has given them a somewhat melancholy air. We hope you enjoy them. The songs remain available for download there. The Blue album, there's hardly a dishonest note in the vocals. At that period of my life, I had no personal defenses. I felt like a cellophane wrapper on a pack of cigarettes. I felt like I had absolutely no secrets from the world and I couldn't pretend in my life to be strong. Or to be happy. But the advantage of it in the music was that there were no defenses there either. Crowe, Cameron (1979). Joni Mitchell Defends Herself. Rolling Stone, July 26. Retrieved September 18, 2017. Entebbe is a city in Uganda, formerly the capital of Uganda before independence. Situated near Lake Victoria, the largest lake in Africa, Entebbe is home to Entebbe International Airport, Uganda's largest airport. Operation Entebbe was a commando operation executed by the Israeli Defence Forces in Entebbe International Airport on July 4, 1976. On June 27, members of the Popular Front for the Liberation of Palestine — External Operations and the German Revolutionary Cells hijacked an Air France plane headed from Tel Aviv to Paris, landing it in Entebbe. The hijackers were welcomed by then-dictator of Uganda, Idi Amin, who supported their aims. The non-Israeli, non-Jewish passengers were released via a flight to Paris; the remainder and crew were held as hostages. The aim of the hijackers was the release of 53 Palestinian prisoners and 5 million dollars, threatening the hostages with death. The hijacking was not sanctioned by the Palestine Liberation Organization; the PFLP-EO is an unaffiliated organization. The raid succeeded in rescuing 102 of the remaining 106 hostages, 2 being accidentally killed by the commandos, 1 accidentally killed by the hijackers, and 1 being left in Uganda as she was in the hospital at the time, who ultimately was murdered by Idi Amin's forces. Amin ordered the murder of hundreds of Kenyans in retaliation, as Kenya assisted Israel with the raid. The raid was widely celebrated by European, Israeli, and American media, although it raised controversy in the United Nations given its violation of the sovereignty of a UN state and the possibility of a diplomatic resolution. Salona was an ancient Roman city located in modern-day Croatia, today known as Solin. It was the capital city of the region for hundreds of years. An abundance of inscriptions are present throughout the city's ruins, the majority with regard to burial. The thousands of inscriptions from Salona, many from the city's necropolises, are outnumbered only by Rome and Pompeii. Its original people, the Illyrians, abandoned the city between 631 and 639. Ivanišević, Dora (2016). Epitaphic culture and social history in late antique Salona (ca. 250 – 500 CE). Doctoral dissertation, Medieval Studies, Central European University, Budapest.